Groupama sailing team are pursuing the final Leg 5 podium position under jury rig after resuming racing on Saturday, while CAMPER have departed Chile and expect to join the French team on the racecourse tonight. Skipper Franck Cammas and his Groupama crew officially resumed racing at 0500 UTC at a point about 50 nautical miles from the coast of Uruguay, where his crew suspended racing with a broken mast at 1542 UTC on April 4. The team will complete the remaining 650 nm to Itajaí with three reefs in their mainsail, a forestay sail and without helmsmen/trimmers Phil Harmer, Laurent Pagès, Thomas Coville and navigator Jean Luc Nelias. Media Crew Member Yann Riou reported it was now more about adventure than competition as the crew set sail with a makeshift rig fashioned from the largest part of the broken mast by the team’s shore crew in the past 40 hours. "It’s a special race, where the challenge is to arrive within a reasonable time; a race where the notion of adventure takes over from competition," he said. "But we have to admit that we don’t really have any certainty on how this trip will unfold." Should Groupama successfully complete the leg they will score 20 points, which will take them to a total of 127 and cement their position in second place on the overall leaderboard. Meanwhile, CAMPER with Emirates Team New Zealand have departed the Chilean port of Puerto Montt and are set to begin their pursuit of fourth place later today. At 0600 UTC the team began the 160 nm journey to a point southeast of Guafo Island where they suspended racing to fix structural damage on Tuesday. They are expected to reach the restart point between 1600 and 2000 UTC tonight. Skipper Chris Nicholson said the pit stop had been a success and he now had full confidence that the red boat was ready to take on Cape Horn. "It’s hard to put into words the effort and commitment of our shore team," he said. "They simply gave up on sleep during our four-day stopover. They knocked out the highest quality work, never a complaint. These are the people that keep these programmes on track." But Nicholson admitted that his crew faced a new race against time as they fight to reach Itajaí in time for the In-Port Race on April 21. "We are now on a very tight time frame to make the in port race in Itajaí," he said. "At this stage the weather looks OK, but it will be a bit push from the entire team so that we are ready for the next leg of the race." Abu Dhabi Ocean Racing are also racing the clock to reach Itajaí in time as weather has hindered the arrival of a ship that will carry their damaged yacht Azzam. The team were scheduled to start the nine-day transit from the Chilean port of Puerto Montt, around Cape Horn, to Itajaí on Saturday. Skipper Ian Walker said the likely departure date was now Monday. Walker said Azzam was primed and ready for the journey to Itajaí, where the shore crew are waiting to start repairing structural damage to the mid-section of the yacht’s port side, which forced the team to retire from Leg 5 on April 2. "Obviously they’ve got bad weather, the ship’s delayed and we just need to get the ship here," he said. "We’re ready to go. In Itajaí, Leg 5 winners PUMA Ocean Racing powered by BERG and second-placed Team Telefónica were relaxing after completing the toughest leg of the 2011-12 edition of the race. Shore crews are also busy surveying the damage caused by 60 knot gales and more than 10 metre waves in the Southern Ocean that forced two teams to retire with damage and three to suspend racing for repairs. 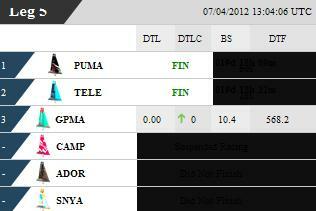 PUMA finished the leg in 19 days, 18 hours, nine minutes and 50 seconds, just under 13 minutes ahead of Telefónica, who remain top of the overall leaderboard with 147 points.